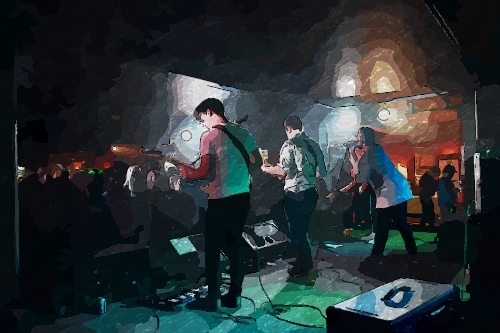 Spotlight Profile: Lost Acres - Spotlight Ottawa	:: Spotlight Ottawa - Your local music scene. Get out and experience it! Lost Acres is a new local Ottawa band just out of the studio from recording their first EP. To prepare for the release, they’ve been booked for a busy November. We caught up with guitarist Dawson Doyle to profile what the new band is about and what to expect. Mike & I were originally in a band together and when that didn’t work out we started this in his basement. We already had songs and ideas when we found Zach and Nick – Mike’s cousins. Why are you in a band & how do you define success? None of us have really been in a band for more than jam sessions or a talent show. We loved it when we got on stage together for the first time and playing our music for people – even if it’s just the bartender – is fun enough to keep us commited. How is a Lost Acres Song formed? Are their set “roles”? Not really, Zach and I come up with most of the music, Mike takes care of most of the lyrics. We bring it to the band and structure it from there – it usually ends up completely different than the original ‘skeleton’. What are some influences on your music? Queens of the Stone Age, Bruce Springsteen, and the Tragically Hip are probably the biggest umbrella influences. We all listen to different genres from metal to alternative to rap. We’ve jammed out One Direction and Jonas Brothers at some practices – regrettably. We usually grab from a handful of Arctic Monkeys, Bowie, and The Strokes covers for our set. We’ve been working on some different covers we are hoping to work in, like Amy Winehouse’s ‘Valerie’ and also ‘Redbone’ – Childish Gambino. We try not to stick to one genre too much. Check out their page here as they prepare for the release of their first EP – and be sure to follow, it doesn’t look like they stay in one spot for too long.